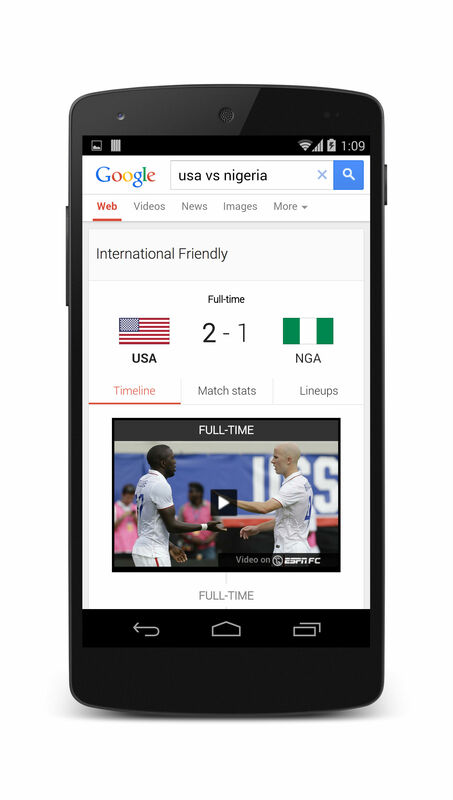 Google is displaying game-specific information within special cards as part of its search results across desktop and mobile, which include a timeline that lists goals shot and other game highlights. These highlights also include recap clips from ESPN as well as links to ESPN’s apps and live video streams of ongoing games on the web. “This is one of the deepest integrations with Google search,” ESPN’s SVP of Technology & Product Development Aaron LaBerge said during an interview Thursday. ESPN has already been cooperating with Twitter (S TWTR) to distribute highlight clips through Twitter cards, but LaBerge said that this cooperation goes much further. ESPN’s content on Twitter is specifically curated by the network for its followers, whereas Google is automatically adding every highlight that ESPN is publishing. “Google gets whatever we have,” LaBerge explained. ESPN’s highlight clips are being produced by a team of around 20, which edit the clips in near real-time and handle all the aspects of distribution. LaBerge said that this team produces highlights both for TV and for ESPN’s digital properties. This means that highlight clips for ESPN’s SportsCenter show will also make their way online. It’s just that online viewers will get to see more content — which will include people seeking out content on Google Search. “This will be a record-setting event, so we wanted to make sure that we were everywhere that we could be,” LaBerge said. ESPN has the exclusive English-language rights for the World Cup in the U.S., and the network is live-streaming each and every game on a number of mobile and connected devices, including Apple (s AAPL) TV, Fire (S AMZN) TV and Chromecast. ESPN’s live streams require that viewers log in with their pay TV account information, something the industry likes to call TV Everywhere, but LaBerge doesn’t think that this will stop many. “We expect that this will be the largest TV Everywhere event ever,” he told me. Want to know how to watch the World Cup while at work? Then check out our handy guide on World Cup live streams.